To get the best results with the Sports theme, use the Sports Team Editor to enter team information—including player names and statistics, player photos, and team logos—for any team you plan to feature in a movie project. iMovie then incorporates this information into Sports theme titles and transitions to give your projects professional polish. In iMovie, choose Window > Sports Team Editor. Add a new team by clicking the Add (+) button in the lower-left corner of the Teams pane (A, below). You can delete the placeholder team, or any other team, by selecting its name and then clicking the Delete (-) button (B, below). Type a descriptor for the season (which is already selected for editing), and then double-click the placeholder team name (some version of Leopards) and type a new name. Click Baseball and choose a team type from the pop-up menu that appears. If the team type you need isn’t listed, see “To add a new team type” below for instructions. To enter player information for a team, select the team in the Teams pane by clicking it once. The header for the Players pane changes to show the name of the selected team. Type a player number in the number field, which is already selected for editing, and then click New Player and type a name. In the blue area (E, above), double-click below each column header (Position, Age, and so on) to make a text field appear, and then type the required information. In the graphic above, the Position field is selected for entering text. To add a player’s photo, drag the file to the Player Photo well. Or, click the Add (+) button in the lower-right corner of the Player Photo well, and browse your computer to find the file you want. Select the file and click Open. The photo appears in the Player Photo well. Modify the zoom level by moving the slider below the well. iMovie supports most common image formats, including JPEG, PNG, TIFF, BMP, and GIF. iMovie also accepts any file size and scales down larger images when necessary. If you have a text file that includes a team roster (names, positions, and so on), you can import it into the Sports Team Editor so that you don’t have to enter each player’s information individually. Go to the topic “To import a player list” below for more information. Repeat the process in step 7 until you’ve entered information for all players. To delete a player, click the name to select it, and then click the Delete (-) button (D, above) in the lower-left corner of the Players pane. To add a team logo, drag the logo file to the Team Logo well. Or, click the Add (+) button in the lower-right corner of the Team Logo well, and browse your computer to find the file you want. Select the file and click Open. iMovie supports most common image formats, including JPEG, PNG, TIFF, BMP, and GIF. iMovie also accepts any file size and scales down larger files when necessary. The logo appears in the Team Logo well. Set it to the correct zoom level by moving the slider below the well. You can edit team information at any time by returning to the Sports Team Editor and repeating the steps described above. If you already have an iMovie project featuring the team whose information you edited, click Update Project so that the project incorporates the edited information. Choose Window > Sports Team Editor. In the Sports Team Editor, click the disclosure triangle (A, below) next to the Sports subhead at the bottom of the window to reveal the current list of sports available. Click the Add (+) button (B, above) in the lower-left corner of the Sports pane. Type the sport name in the New Sport field (C, above), which is already selected for editing. In the blue area, double-click Label 1 and type a parameter that you want to be able to define for players on that team. For example, for most sports, you want to be able to indicate a player’s position, age, and so on. But for gymnastics, for example, a parameter might be “specialty,” so that you can indicate that a gymnast focuses on balance beam or tumbling; another parameter might be “event medals.” You can define up to four parameters using the Label fields. The new team type appears in the Sport pop-up menu in the Teams pane. 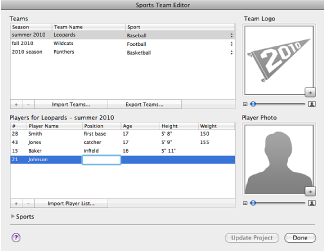 After you create a team in iMovie, you can export the team information (including logos, player photos, and other player data) to a file. Exporting is useful in two significant ways: It’s a great way to archive the team data. Also, if you have iMovie on another computer, you can move the exported file to that computer and then import it into iMovie so that you can work on team videos from there. To import a team, click Import Teams (A, below) at the bottom of the Teams section of the Sports Team Editor. Browse for the team file in the Finder window that opens, select it, and then click Open. The team you just imported appears immediately in the Teams list. To export a team, select it in the Teams section of the Sports Team Editor by clicking its name, and then click Export Teams (B, below). In the dialog that appears, type a name for the exported file in the Save Team field, choose where you want to save the file from the Where pop-up menu, and then click Save. Team files have a “.imovieteams” extension. You can export more than one team at a time by Command-clicking as you select teams. If you already have team information stored in a tab-delimited text file, you can import it into the Sports Team Editor to save yourself the time of having to enter player information manually. In the Sports Team Editor, select a team to import the player list to by clicking its name once in the Teams list. If you don’t yet have a team, you need to add one first by clicking the Add (+) button in the lower-left corner of the Teams pane. Click Import Player List at the bottom of the Players section of the Sports Team Editor. Browse for the player list text file in the Finder window that opens, select it, and then click Open. It must be a simple text file. Most file types that can be opened with TextEdit will work, including plain text (.txt), Rich Text Format (.rtf), Word 97 (.doc), Word 2003 (.xml), and Word 2007 (.docx). Each line in the file should have information about a single player only. Each piece of information in a line should be separated by tabs. Each line should include, in this order, the player number, player name, and up to four player statistics (additional player statistics are ignored). The players appear immediately in the Players list.